A black dresser and chaise (subsequently re-covered) are two of the few furnishings that homeowner Kate Stapleton brought with her from her former home in Chicago. The painting by Jane Dahmen is one of the first works of art that Stapleton acquired. Stapleton inherited this side chair, which she painted pink. The image to its right is by Chineseborn, U.S.-based artist Yang Yang. By removing a wall, Portland’s Papi and Romano Builders turned a small galley kitchen into a bright, white space. Contemporary details include frameless cabinet faces, chrome levers (rather than knobs), and clear acrylic stools. The encaustic is by Dietlind Vander Schaaf. 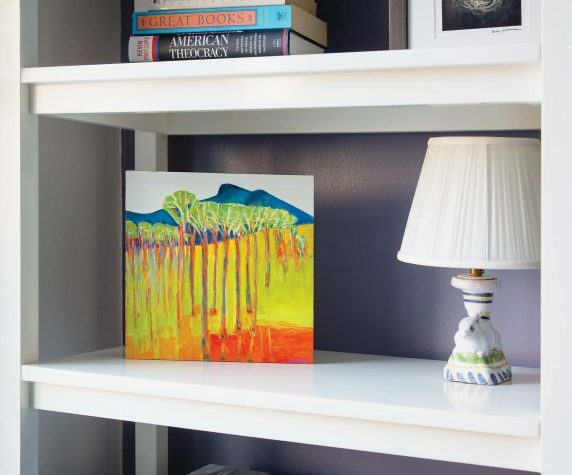 A small landscape by Lindsay Hancock sits on a shelf in the guest room. The shower in the owner’s bathroom is tiled with marble. Sarah Szwajkos’s Old Spools, a photo printed on metal and acquired through Vox Photographs, reminds Stapleton of her grandmother who was a seamstress. One of Stapleton’s favorite pieces in her art collection is Fish Dress, an oil by painter and aerosol artist Tim Clorius. The painting is of a dress that, on closer inspection, is revealed to be composed of fish. A piece by Mary Hart is on the left. Stapleton named this wooden dog “Ralph”. A gift from former colleagues, he guards the door to her kitchen. A second bedroom in the condo serves as den/office/guest bedroom. The charcoal gray sofa is a sleeper. The graypurple wall color was chosen to highlight The Tarn, a large format color photo by Jim Nickelson of Belfast. The rug is by Angela Adams. The “bubble" theme that appears throughout the house is seen in the fabric on the Room and Board walnut dining room chairs and the three round pendant lights, which have bubbles etched into the glass. The table is expandable, and the pendant lights, which are hung at different heights, are on a track so they, too, can be moved. The landscape is by the late Canadian artist Wynona Mulcaster. Two Jane Dahmen paintings, from two different periods of the artist’s career, hang in the owner’s bedroom. Bubble detailing appears in the light above a bathroom mirror. Not that Anne Orr of And/Or Design of Youngstown, New York, believed her. “I had to clarify it with her about five times before we proceeded,” Orr says. An understandable enough inclination, as Orr was familiar with Stapleton’s customary taste. The two women had been friends since they worked as management consultants on a telecom merger in the late 1990s, when Stapleton lived in Chicago and Orr in San Francisco. Stapleton’s homes over the years, including a 1920s apartment-turned-condo in Evanston, Illinois, had tended toward the traditional. What’s more, the Portland apartment Stapleton was proposing to remodel was in a 12-unit, 1980s brick building. With small rooms, crown mouldings, and a dark galley kitchen, it bore no resemblance to the uber-modern inspirational photo that Stapleton had clipped from the New York Times “Living” section and sent to Orr. To step back: Stapleton, an executive at Unum in Portland in the 1980s and 1990s, had been hoping to return to Maine for years. As a global consultant, she could work anywhere, as long as she had access to an airport. She made the move back in 2010, and to determine where she’d most like to be, she rented furnished apartments for a month or two in a variety of Portland neighborhoods. She thought the West End—quiet and within walking distance of downtown—was perfect, but the sticking point was a garage. Having lived in Chicago, Stapleton knew she didn’t want to go through a winter without one, even though she travels by bike when the weather permits. Eventually, her realtor found a property that fit her criteria. 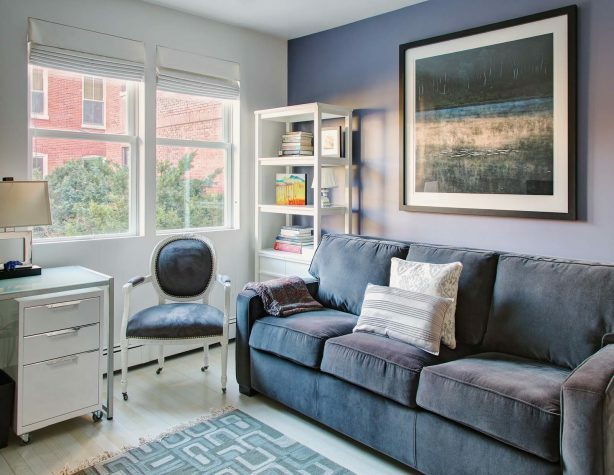 The two-bedroom apartment was a comfortable size and included a small basement room adjacent to the garage, which could be used as an all-purpose “piano/library/workout/laundry room.” Other than that, “Nothing else was to my taste,” Stapleton says. 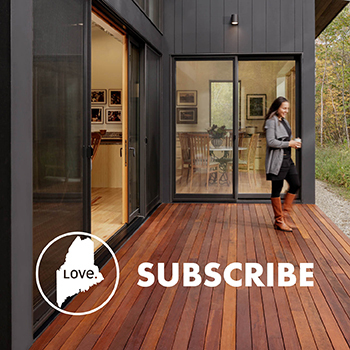 She enlisted builder Rick Romano of Papi and Romano Builders in Portland to help. “Having grown up watching The Jetsons, I had a vision of what she wanted: something very, very white, and very smooth with little articulation,” Romano says. Off came all the trim and moulding on the windows. Out came the low ceiling. Down came the walls between the living room, dining room, and kitchen. In went new wiring, plumbing, and energy-efficient windows. 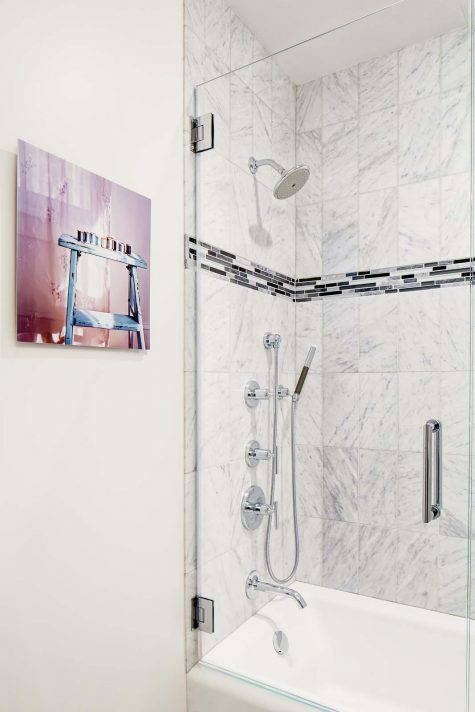 Meanwhile, the bathrooms were gutted and outfitted with new glass showers, IKEA sinks and vanities, chrome fixtures, and porcelain floor tiles with a linen texture. The main space’s yellowing oak floors were sanded. Rather than bleaching (a common but environmentally harmful process), the floors were finished with a low-VOC white paint, which was wiped to bring out the wood grain. They were then sealed with a natural-based water sealer. 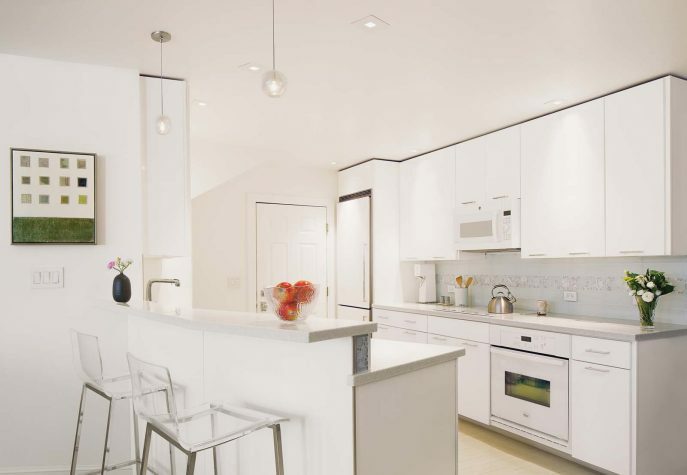 A diagonally set peninsula was installed to separate the living/dining area from the new kitchen, which featured white appliances and white-lacquered, European-style frameless cabinets (handcrafted by Romano’s team) with clean chrome levers and minimal reveals between doors and drawers. The windows received white-cotton Roman shades. To soften the effects of the apartment’s sleek lines, bubble-themed details were incorporated into the interior finishes, lighting, and furniture. These include glass-and-marble kitchen backsplash tiles with a circle motif, Lucite bubble sconces in the dining room, and round, glass pendant lamps etched with small dots that hang over the kitchen peninsula and dining room table. 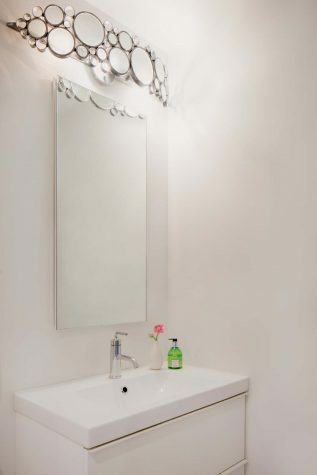 The circles on the black and white fabric of the dining room chairs and the multiple circles of the fixture above the owner’s en suite bathroom mirror continue the theme, as does a large circular mirror in the foyer. Stapleton jokingly calls her bedroom the “babe cave.” It features an accent wall of navy blue and brown damask wallpaper and a dark-wood sleigh bed from a previous home. 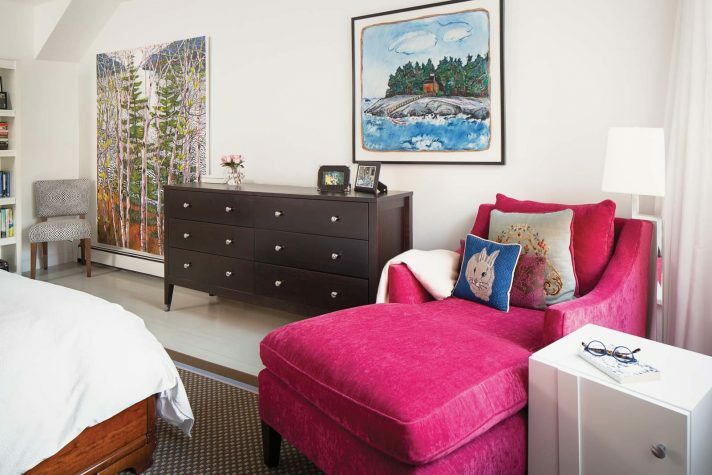 The darker colors are lightened with white linens and surprising fuchsia additions: a raspberry chaise lounge and a claw-and-ball chair inherited from Stapleton’s mother and painted bright pink. “Because isn’t that what Jane Jetson would want?” jokes Orr of the eye-popping shade. Pin lights dot the room’s white, silk floor-to-ceiling curtains. Although the Mulcaster has a central spot in Stapleton’s living room, Maine artists now dominate her collection. 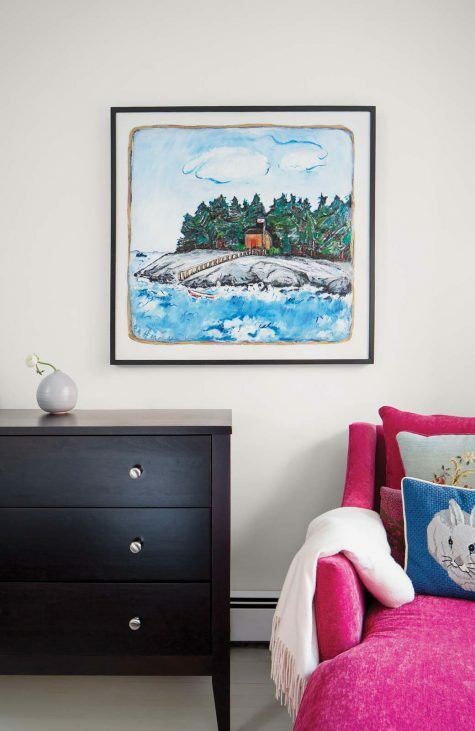 Her bedroom features two Jane Dahmen paintings: a landscape of an island scene and a diptych of a lake seen through birch and spruce trees. The latter work hangs on the wall nearest the foot of Stapleton’s bed. 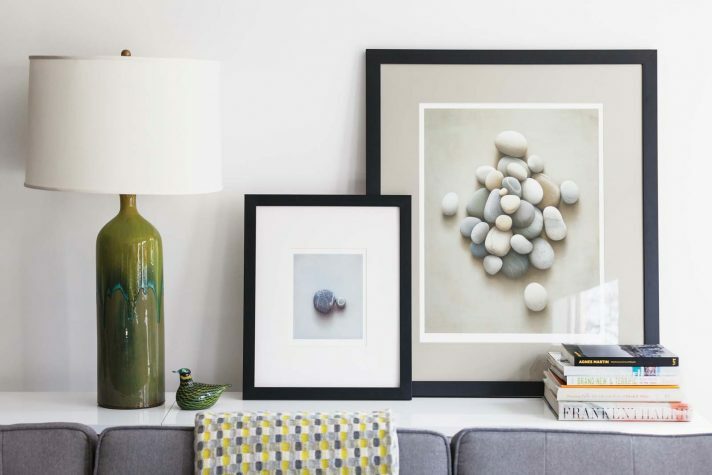 “When I look up,” Stapleton says, “it’s like I am in a cabin.” Two stark Alan Magee prints of photorealistic paintings of beach stones (“like meditations for me,” Stapleton says) were another early purchase. They’re propped on a credenza behind a gray contemporary sectional sofa by Gus—coincidently, the model of the sofa is called “Jane”—and next to an oversized green table lamp. Stapleton nicknamed the lamp “Astro,” perhaps because it once proved as ungainly as the Jetsons’ cartoon canine, when she and Orr tried to angle it into a car for a trip to the paint store. It was a successful effort: the foyer’s wall is now a moss green that matches the lamp’s base. The guest bedroom provides a contrast to the white of the public rooms, with an accent wall painted blue-purple, a charcoal gray sleeper sofa, an Angela Adams rug, and two French provincial chairs that have been painted in a white lacquer and reupholstered with charcoal gray suede. Artwork includes Jim Nickelson’s large-format photo of steam off a tarn at sunrise and Lindsay Hancock’s small, semi-abstract painting of trees on a lime green and orange ground, fronting a blue hill. A bent for edgy feminist art can be seen in this room, too, in three Nancy Grace Horton photos from the artist’s Ms. Behavior series, including one of a woman lying on an ironing board, her dress suggesting 1950s housewifery. The work hangs over a small Rose Marasco photo, also of an ironing board. Other pieces in the collection include three John Kelley minimalist black-and-white photos: one of Aroostook County in winter, another of an interior room at Pettengill Farm in Freeport, still another of the coast in Acadia. 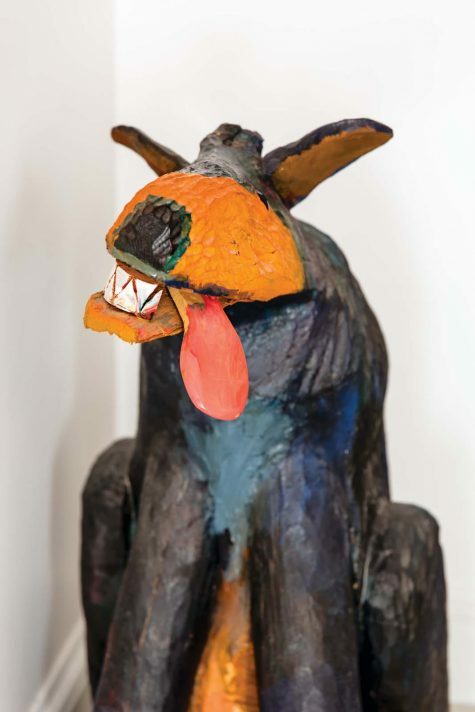 As a member of the board of trustees at the Maine College of Art, Stapleton tends to know the backstory of the artists in her collection, many of whom have studied or taught in Maine. An encaustic by Dietlind Vander Schaaf, which features green squares on a white background, represents glimpses of what the artist saw while looking through windows as she walked San Francisco streets. 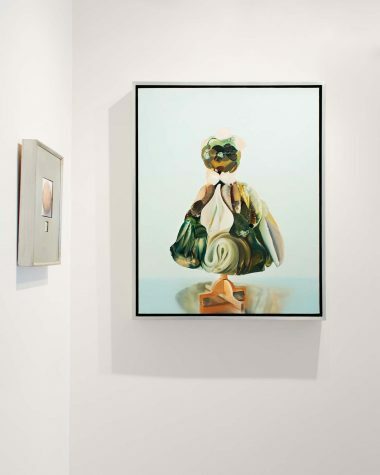 A Mary Hart work consists of a silver shadow frame that encases two small paintings, one of which, Stapleton points out, features the painter’s image reflected in the pearl she is painting. Other work includes a small Linden Frederick painting of boxcars at night and a work by Dozier Bell, an abstraction overlaid with silver crosshairs. “All the art I have isn’t for any reason other than my own interest,” Stapleton says. “I’m not buying things for value, but because I love them.” The same seems true of all the items in her home, from a Thos. Moser leather chair in the living room to a pillow on her bedroom chaise that her mother had at the end of her life. 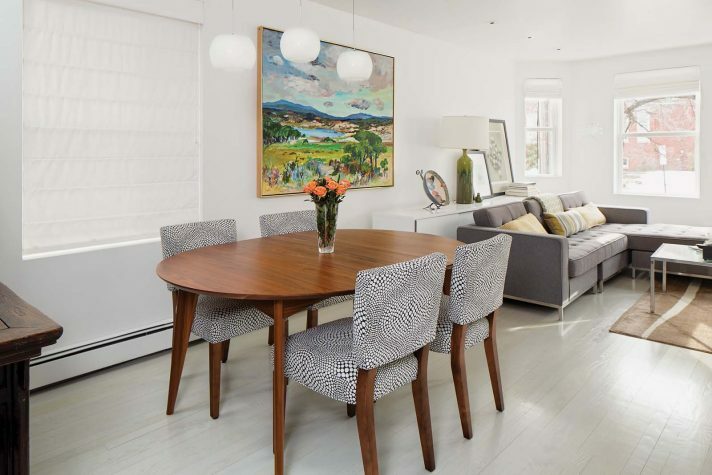 If a 1960s TV show inspired the condo’s interior design, the result suggests a twenty-first century book: Marie Kondo’s The Life-Changing Magic of Tidying Up, which argues that possessions should “spark joy.” In Stapleton’s home, they always do.